EH939 JN-J ‘Johnny’. the aircraft the boys flew 13 of their 21 ops in. 18 Aircraft were detailed to attack the above targets with incendiary bombs of 30lbs. and 4lbs. All aircraft with the exception of one which failed to return, successfully dropped their bombs in the target area. Very large fires which were well concentrated and spreading, were seen. All crews were of the opinion that this was a good attack. Moderate heavy A.A. fire and a few searchlights were encountered, which were ineffective. A great number of enemy aircraft were seen and some short combats took place. The aircraft captained by F/Sgt. Batger, H. sighted an enemy aircraft 600 yards away, ahead and the front gunner fired a long and short burst, the enemy aircraft then disappeared and was claimed as possibly destroyed. . The aircraft captained by F/S McGregor,K. sighted an Me110 astern, the rear gunner fired a long burst. The enemy aircraft replied and dived away with smoke pouring from its engines. It is claimed as a possible destroyed. There was 8/10ths cloud at the target approaches although it was clear in the target area. Navigation was very good. The missing aircraft was Stirling MK.III EH938 captained by Sgt. Parkin, T.
Page 567, 1943. Form 540/ 541 AIR27/ 646 75(NZ) Squadron RAF, Mepal. National Archives. F/Sgt Victor Trevor Parkin RNZAF NZ421090. Pilot. 29TH Jul to 31ST Aug 1943. Died Tuesday 31st August 1943, age 21, during a raid on Munchen-Gladbach. Buried Heverlee War Cemetery Belgium. 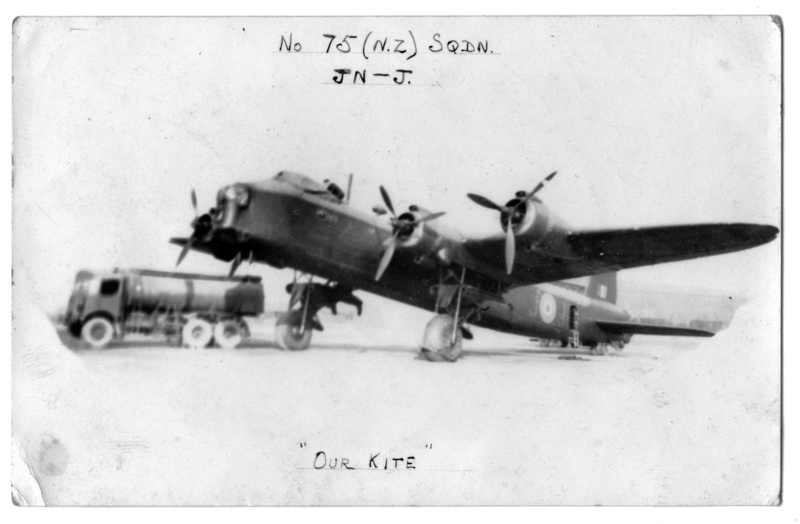 F/Sgt Terrence Watters RNZAF NZ417299. Nav. 5th to 31st Aug 1943. Died Tuesday 31st August 1943, age 21, during a raid on Munchen- Gladbach. Buried Heverlee War Cemetery Belgium. Sgt Ralph Valentine Clingan Johnson RAFVR 1545885. AB. 5th to 11th Aug 1943 Shot down night of 31 Aug-1 Sep 1943 and successfully evaded capture. Sgt William Hadley Horrigan RAFVR 1176649. WOAG. 5th to 31st Aug 1943. Died Tuesday 31st August 1943, age 29, during a raid on Munchen-Gladbach. Buried Heverlee War Cemetery, Belgium. Sgt Trevor Silcock RAFVR 1582836. FE. 5th to 31st Aug 1943. Died Tuesday 21st August 1943, age 20, during a raid on Munchen-Gladbach. Buried Heverlee War Cemetery Belgium. Sgt Richard Frederick Grove RAFVR 1581242. AG. 5th to 31st Aug 1943. Died Tuesday 31st August 1943, age 22, during a raid on Munchen-Gladbach. Buried Heverlee War Cemetery, Belgium. Sgt Anthony Francis Saunders RAFVR 1394719. AG. 5th to 31st Aug 1943. Died Tuesday 31st August 1943, age 20, during a raid on Munchen-Gladbach. Buried Heverlee War Cemetery Belgium. 660 aircraft – 297 Lancasters, 185 Halifaxes, 107 Stirlings, 57 Wellingtons, 14 Mosquitos – tasked to carry out a double attack on Mönchengladbach and Rheydt. The visibility was good and the Oboe-assisted marking of both targets was described in Bomber Command’s records as ‘a model’ of good Pathfinder marking. The bombing was very concentrated with little creepback. Page 427, The Bomber Command War Diaries. 2011. Everitt Middlebrook. Midland publishing.